Carl von Clausewitz is known today as the West’s most influential military thinker. His seminal treatise On War lies at the heart of modern military doctrine. One recent article even compared its status among U.S. officers to that of St. Paul’s letters among Christians. For generations of readers of On War, Clausewitz, the private man, has been of a bit of mystery. Contemporaries noted that he was reserved and spoke freely and genially in the company of good friends. Although a veteran of many battles and campaigns, Clausewitz often avoided directly citing his own experience in his writings. Only recently his military achievements became the subject of an extensive study, found largely in Donald Stoker’s Clausewitz: His Life and Work. The newly discovered complete correspondence between Carl and Marie von Clausewitz offers invaluable clues about the military theorist’s times, personal life, and writing habits. And, finally, they shed some light on Carl as the person and writer, instead of just the theorist. Just ask his wife, Marie. Throughout the years, in her correspondence, she complained extensively about Clausewitz misplacing important letters and even a military map that he needed as a staff officer. He debated ideas with Marie but then failed to capture them on paper. A thorough thinker, Clausewitz often revised his manuscripts and wrote in the margins or left long amendments but then forgot to leave a clear copy. His disorganized streak explains the circumstances when, after her husband’s untimely death, Marie prepared On War for publication. In her preface she wrote that “we shared everything,” so “a task of this kind could not occupy my beloved husband without at the same time becoming thoroughly familiar to me.” She seemingly contradicted herself a couple of passages later, however, by describing the tedious process of final revisions. If she was so familiar with Clausewitz’s work, it might be expected that she knew immediately where to find the corrections. Only by keeping in mind his tangled writing manner can we understand the challenges Marie faced when she prepared On War for publishing. As a junior officer from the provinces, he was smitten with Berlin’s highly educated, witty, and well-connected ladies. In early nineteenth century, the Prussian capital boasted its own popular salons where spirited women hosted literary gatherings. In a letter to Marie, Clausewitz even admitted fantasizing about a friendship with one of the “bright” or “thoughtful” (gehaltreich) ladies he observed as an outsider. Born Countess von Brühl and a prominent member of Prussian high society and court, Marie was just that. Clausewitz treated her as his intellectual equal and often relied on her connections and political knowledge. Later in life, he fostered close relationships with scores of prominent women. Many of them, like the novelists Bettina von Arnim and Sophie von Schwerin, the famous political saloniers Princess Louise Radziwill and Elise von Bernstorff, produced accounts presenting Clausewitz in a very sympathetic light. He left enough evidence that he took women’s roles in political and public spheres seriously. After 1826, for instance, Clausewitz wrote an analysis of the War of the Spanish Succession based on the published correspondence of Madame de Maintenon to the Princess des Ursins. He passionately argued that one should not dismiss the book simply because these were “the words of a woman.” Quite the opposite, Clausewitz stated; even if Madame de Maintenon in particular had “no talent whatever for matters of state and for war,” she still was so close to Louis XIV and the French court that her letters bore invaluable information about the war. In taking women seriously, he was a man ahead of his time. Other men in that period displayed increasingly exclusive, simplistic, and patently colored by exaggerated masculinity world views, but Clausewitz understood better the complex socio-political realities. It might have also been one of the reasons he decided to write On War in an objective tone free of moral judgment, and to deliberately avoid the language of male heroism, bravado, and sacrifice. 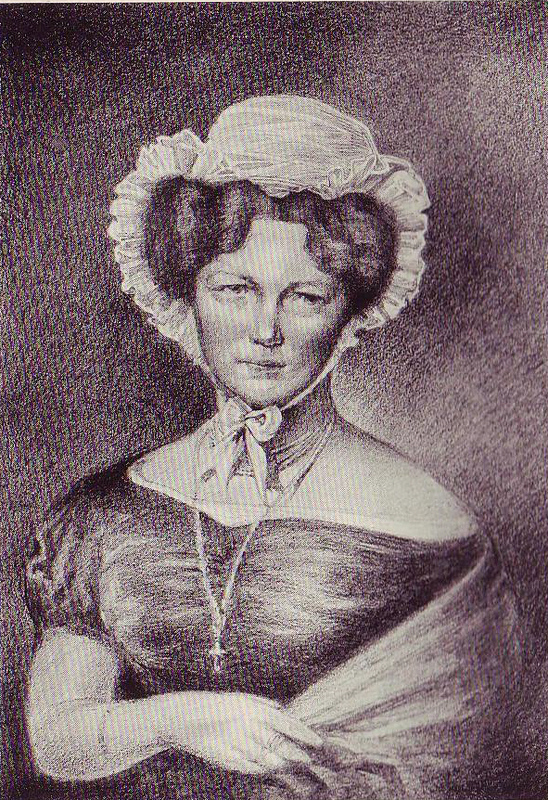 Marie was the driving force behind Clausewitz's interest in the arts. Early in their relationship she tutored him in the matters of art and aesthetics. Marie was a talented artist, although she lacked academic training. She studied art on her own and befriended prominent artists. Her portrait of the Prussian war hero August Neidhardt von Gneisenau is now part of the German Historical Museum’s permanent exhibition. Marie might also have been the artist who created the newly discovered drawing of Clausewitz. “Architects and painters know precisely what they are about as long as they deal with material phenomena." Later he even wrote essays on the subject of appreciation of fine arts, architecture, and interior design. What interested Clausewitz most were the psychological mechanisms of creation and perception. He used art metaphors in On War to explain war’s complex nature in simpler and visually more compelling terms. “Architects and painters know precisely what they are about as long as they deal with material phenomena. Mechanical and optical structures are not subject to dispute. But when they come to the aesthetics of their work, when they aim at a particular effect on the mind or on the senses, the rules dissolve into nothing but a vague idea,” he wrote in Book II. In the same way, Clausewitz suggested, moral factors in war were difficult to pinpoint but any military action should take them into account and aim at them as well. This is one of the most prevailing misconceptions about the military theorist’s last decade in Berlin and it has cast a long shadow over his legacy. Remember John Keegan’s description of Clausewitz as “unpromoted and largely unhonored in his own country”? Maybe the explanation why he preferred to stay in the War College is the obvious one. Clausewitz was working on On War. It is true that the early 1820s were a tumultuous period in Prussian history. In the polarized political climate many decorated and distinguished veterans found their character and achievements besmirched and chances for career advancement diminished. The reactionary clique also blocked Clausewitz’s ambitions to become a diplomat. Yet to argue that he was marginalized or unrecognized by his contemporaries would be a great exaggeration. Throughout the 1820s, Clausewitz served as the director of Prussia’s War College. As Marie’s letters and memoirs of contemporaries clearly indicate, she and Carl never really retreated from the public sphere, but were part of Berlin’s busy social scene and permanent fixtures in some of most influential salons of this period, including those of Elise von Bernstorff and Antoni and Louise Radziwill. For Clausewitz, writing On War was not a substitute for his stalled career, but a parallel intellectual endeavor. It remains unclear why he did not apply for another position, but remained for a decade at the same job. Newly found letters written by Clausewitz to family members in the late 1820s suggest that he was not despondent or insecure. When Clausewitz applied for the king’s confirmation of his family’s nobility status, a contentious matter, he explained that he did not worry for his own position because he was “too high in rank” to become the subject of attacks and rumors about lack of noble birth. Clausewitz wanted to clarify the matter in order to secure his nephews’ future. By avoiding a lengthy investigation and swiftly confirming the family’s noble status, Friedrich Wilhelm III indeed validated Clausewitz’s opinion that the latter was a man of eminence in Prussia. Maybe the explanation why he preferred to stay in the War College is the obvious one. Clausewitz was working on On War, a groundbreaking treatise aiming at nothing less than the overhaul of existing military theory. He simply did not have time or desire for office politics. He was a kind man who wrote doting and caring letters to Marie, friends, family members, and former students. Once, after a bitter outburst and full of remorse, Clausewitz drew a medal and a general’s mustache for his wife, as a recognition for the patient way she handled his frustration. In the company of close friends, as many accounts bear witness, Clausewitz was witty and pleasant. However, he had no patience for ignorance and stupidity, which might explain why some contemporaries left unfavorable accounts of him. In 1815, when confronted with the realities on the ground, Clausewitz sharply condemned Prussia’s policy of revenge against the defeated French. In a letter to his friend Gneisenau, he wrote that initially his troops had been welcomed in Le Mans “with open arms” but requisitions, confiscations, and humiliations, “unknown in these lands since the Hundred Years’ War,” had alienated the civilian population and brought it close to insurrection. Clausewitz might have been a German patriot, but he was also a thinking and feeling man who opposed acts of unnecessary cruelty. His sardonic image, in all probability, is due to the subject he chose to study and the realistic and judgement-free approach he applied to it. Moral considerations of “kind-hearted people,” Clausewitz famously wrote, should not play a role when military decisions are made. War is such a dangerous business that it has to be conducted with utmost decisiveness. Yet this moral-free concept is actually deeply moralistic. Clausewitz’s approach was born out of a conviction that relating knowledge in the most realistic manner was the only way to genuinely understand the world. War, in his view, is a nasty business and one should learn how truly nasty it is in order to avoid bloody, costly mistakes. And when compelled, to wage it, if possible, in an efficient and decisive manner. The above little-known aspects of Carl von Clausewitz are just a few that show the man behind the work...and the characteristics that affected his writing. Vanya Eftimova Bellinger is an independent scholar and journalist. Her biography, Marie von Clausewitz: The Woman Behind the Making Of On War, just released by Oxford University Press-USA, is based on the newly discovered complete correspondence between Marie and Carl von Clausewitz. Follow her on Twitter at @VanyaEF. The views expressed in this article do not reflect the policy or position of any official organization.